The spice Grains of Paradise are tiny, unique pyramid-shaped seeds whose flavor profile can be described as sharp and peppery with a fruity backdrop. They look ashy when you crush them with a spice grinder or mortar & pestle. Substitute Grains of Paradise for black peppercorns. Try seasoning your steak with crushed grains of paradise, salt and hungarian paprika. The flavor combination really works. Look for them at your local spice shop. My family has been requesting an apple dessert. 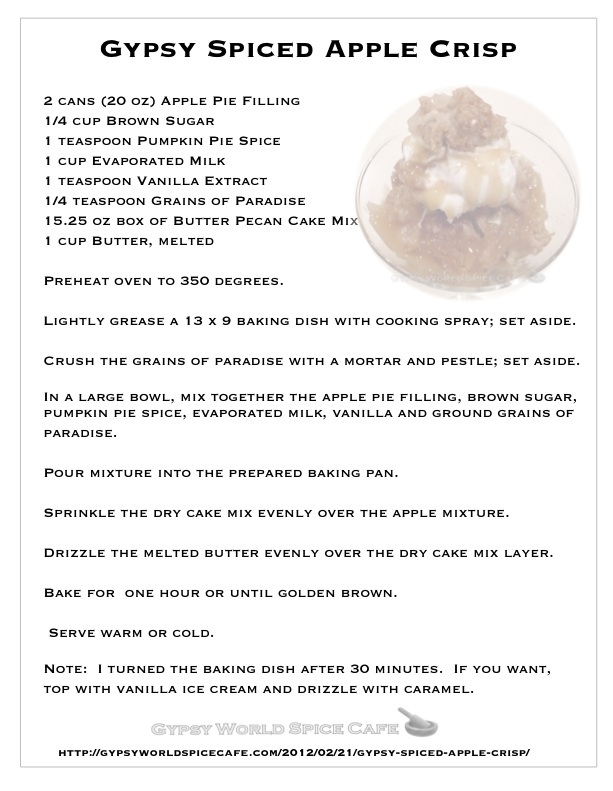 Below is an apple dessert recipe that features Grains of Paradise. Lightly grease a 13 x 9 baking dish with cooking spray; set aside. Crush the grains of paradise with a mortar and pestle; set aside. In a large bowl, mix together the apple pie filling, brown sugar, pumpkin pie spice, evaporated milk, vanilla and ground grains of paradise. Pour mixture into the prepared baking pan. Sprinkle the dry cake mix evenly over the apple mixture. Drizzle the melted butter evenly over the dry cake mix layer. Bake for one hour or until golden brown. Note: I turned the baking dish after 30 minutes. If you want, top with vanilla ice cream and drizzle with caramel.